Around 30% of the average householder’s kitchen bin can be recycled as burnable waste in the Logmaker. 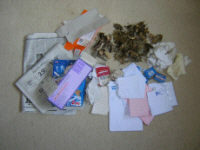 Shredded junk mail, shredded paper, newspaper, wrappings from food and household products, cardboard, tissues, ripped up toilet rolls, olive stones, nuts, tea-bags (dried), used coffee beans and coal dust. 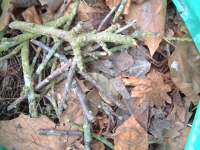 Garden waste can be recycled in the same way: chopped twigs and branches, sawdust and dried leaves and foliage. Keep a separate bin for your burnable waste. Not only will you reduce the amount of waste that would otherwise go to landfill sites but you’ll help conserve forests by reducing wood felling and consumption. By sorting and saving your burnable waste you’ll always have a ready supply of burnable material to use in your Logmaker, and less rubbish to cart outside for the refuse collectors! 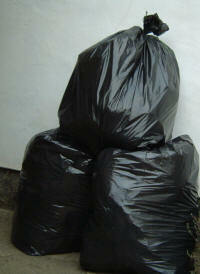 The logmaker makes it easy and fun for every householder to re-use, re-cycle and recover waste. Remember: Don’t bin it, burn it.